It is that time of year again when we are all thinking about time. Time past and time to come. We take time to remember what we dreamed and planned, and time to enjoy our accomplishments of the past year. So, now is the time to dream some new dreams. It is time to make some new plans. As members of the Grange we want the time we dedicate to Grange to accomplish something each and every year. We want more members to get involved by helping in our projects, activities, programs and meetings. So, let's take some time to dream and plan ideas to accomplish that help accomplish our goals. We all know that we want to get new members in the Grange. One of the things we want from them is their time. I know a couple that would make great Grangers; they are already active in the community. They have three young boys that are in soccer, football, basketball, art classes, and 4-H. This couple helps out with the PTO, the political parties, the school, and all of the local activities like rodeo and parades. So why aren't they Grangers already? They are already too busy! Then why am I doing all those same things right alongside them and yet I still have time for Grange? I found myself making excuses for them without even asking them to join the Grange. When I did ask them they gave me the answer I was expecting, "We are too busy to join one more thing." That's when I answered, "I am doing all the same things you are and I am a Granger." I gave them a short explanation that the Grange just wants you to work with us on these same projects and bring fresh new ideas to the Grange, so we can benefit from their prospective and add our voice with theirs. You see, once you find people doing the things that you have dreamed and planned for at the Grange, asking them to join and help the Grange get involved with their cause is easy. Time is a funny thing. I can still picture that old Christmas cartoon that showed the New Year baby crawling in with the sash of the new year, chasing away Father Time, with his long white beard, cane, and sash of the past year walking away. Each year people make resolutions for the up and coming year and those resolutions are like the New Year's baby. They have all the potential ahead of them, but at the end of the year folks look back and see which of the resolutions came to be and which ones didn't. This is called experience and is the essence of Father Time. As you dream and plan for the year ahead, don't forget your experiences and be smart about your resolutions. Make some easy to obtain, others that you make should require some effort, and don't forget to challenge yourself with one or two that will stretch your abilities and force you to make some changes so that you grow as an individual. Was your Grange time well spent in 2009? What will we do differently with our time in 2010? How will we spend time at meetings? How much time will we spend doing community service? Do we need to spend time fund raising? 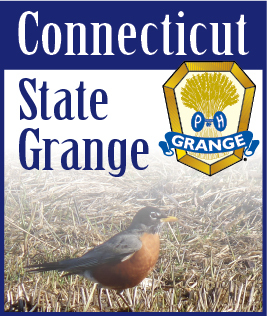 Does the Grange need to spend more time on legislation? Maybe we need to spend more time having fun? We definitely love spending time eating! Thanks for taking some time to read this tip of the month. How much time does it take to ask someone to join the Grange? Not much more than the time it took to read this tip. I think the time we spend in the Grange doing all the many good things the Grange does is time well spent! So, ask someone to join, so they too can get that same feeling of time well spent!